ne person is dead after a GO Transit bus rolled over on Highway 407 in Vaughan at Weston Rd. shortly after 10 p.m. on Wednesday, York EMS confirms. Three other people have been transported to hospital, according to EMS, who responded to the call at 10:06 p.m.
Four men, including the driver, and two women were on the bus at the time of the collision, Kerry Schmidt of the Ontario Provincial Police told reporters on scene. Three people, including the driver, were transported to hospital with various injuries, two of them were not injured, and one male passenger died on scene, said Schmidt. The driver was treated for minor injuries after being extricated, according to according to Anne Marie Aikins, media relations manager for Metrolinx. 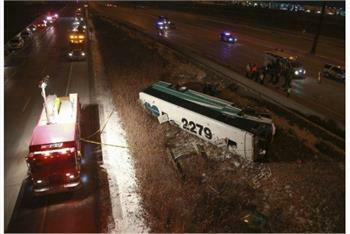 The bus was travelling eastbound on Highway 407 from Hamilton to York University. It had left at 8:30 p.m. and was scheduled to arrive by 10:10 p.m., according to a GO Transit tweet.